Gears of War 4 will get its first multiplayer beta next month, Microsoft revealed today. Microsoft has revealed that a lengthy Gears of War 4 multiplayer beta for Xbox One will be launching in April. 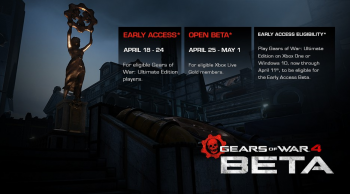 The beta will open in early access from April 18-April 24 for gamers who have logged into Xbox Live and played Gears of War: Ultimate Edition on either Xbox One or Windows 10 - and you can still qualify, if you play now through 11pm PDT on April 11. Everyone else will be able to hop in after the early access beta ends, on April 25, assuming they are a qualifying Xbox Live Gold member. The open beta itself will run through May 1. Players will receive tokens in waves through the Xbox Live messaging system that will grant them access to the beta, so there's no need to sign up for anything in order to get in. You do, however, need to be 17 or older to participate. Gears of War 4 was originally scheduled for a Holiday 2016 release, but was surprisingly pushed forward, now expected to release in Fall 2016.